Quickly create any type of technical drawings like a pro, Cad Pro is the leading source for technical drawing software. Creating and designing technical drawings does not have to be difficult, Cad Pro provides accurate and easy-to-use drafting and design tools. Share your technical designs with contractors, clients, patent office or team members using Dropbox®, Google Drive™, OneDrive®, and SharePoint®. Export them to Microsoft Word®, Excel®, PDF, or PowerPoint® with a single click. Sketch Tracing – Sketch your technical drawings on a piece of paper, and then scan it. Now open your scanned sketch in CAD Pro and it becomes a traceable template that you can easily modify to meet your technical design specifications. Communicate your technical design ideas more effectively. CAD Pro is the only software that allows you to add these interactive web features. Add pop-up text memos to your technical drawings to support areas in detail. Add pop-up photos and transform ideas into technical designs you can visualize. Technical Drawing Software for Patent Submissions. CAD Pro’s smart tools allow you to design any type of patent designs and much more. 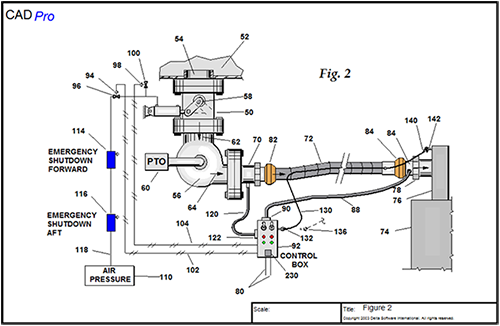 These patent drawings can save time and money when submitting your next patent design or invention. With over 2.5 million users world-wide, CAD Pro is a leader in technical drawing software. CAD Pro offers a full featured set of design tools which will allow you to design anything the easy way. Editing Tools – Allow for quick and easy editing of any design or drawing you have created or imported. Draw Tools – Will provide the necessary geometrical shapes that all technical designs are created with. When combining these tools with the edit tools you have endless possibilities. Snap Tools – Provide accurate and simple alignment of objects while designing your technical drawings. Dimensioning Tools – These tools provide you with on-screen instructions when using them. Accurate dimensions are one of the most important factors when creating precise technical designs and blueprints. CAD Pro is your #1 source for technical drawing software; providing you with the many features needed to design your perfect patent drawings! Browse our technical drawings now! For more information concerning our software, please feel free to contact us.